Well, folks, I don't want to brag, but I think it's fair to say I took holding stuff to a whole new level at the video shoot on Monday. And congratulations as well to our other 4 pitchers - Rena, Joy, Kirsten, and Stacy - for their terrific pitches! Great work, everyone! I'm feeling a little calorically depleted after all that cheering, and I think we all know the best way to deal with that... :) Something Chocolate, anyone? Today's pitch comes to us from Julie G. With her background in pediatric nursing, Julie Anne Grasso spent many years literally wrapping children in cotton wool. Every day she witnessed great resilience from the tiny people she cared for, which inspired her to write stories about a little girl elf just like them in The Adventures of Caramel Cardamom Trilogy. After participating in Tara Lazar’s PiBoIdMo in 2013, Julie has been furiously developing her picture book manuscripts. She lives in Melbourne Australia with her husband Danny and their little elf Giselle. Lots of luck on this pitch, Julie! Yes - I'm in! For the both the chocolate and especially the pitch! I think Julie hits three fabulous points - She gives us a great quirky hook with the first sentence giving us what the MC wants and his mother's reply. "You can't escape your genes." The second is the high concept so easily pictured - kids staring at belly buttons while he's hiding his coiled middle - ha! - and the third we find out he saves the day and where he fits :) I would definitely add this to my book shelf. Yes, I would read this--definitely an original take on a common theme for kids--wanting to fit in and be like everyone else. I like the pitch a lot. My only suggestion might be to be more specific with the "just another day at school becomes a rescue mission ..." I'm hearing that editors/agents actually want to know EXACTLY what the situation IS. Good luck and thanks for sharing! Sure, I'd read it. The title is catching, and I like the pitch up to the words, "his mother's status." Maybe the rest can be deleted. Is slinky, like slinky the toy? If so, I can see this as his quirk, sort of like Flat Stanley. In fact, it could become an early chapter book and morph into a series. ? The cocoa looks yummy! Have a great day, Susanna & Julie. Congrats to you on your personal best in holding things! And congrats to Beth on winning the pitch! As for Julie's pitch, it sounds like a great idea, and I'd love to read it. I think the pitch is quite good, but it would be more compelling if it were shortened and focused more. There are 3 spots where Julie alludes to his difference but doesn't explain what Slinkys are and what kind of powers or special abilities they have. While she shouldn't give away the story, she might hint a little more at it. The story sounds very fun! Sort of a super hero, slinky guy! I would read for sure! In fact, I would be in my car today to go pick it up if it was at the library or bookstore! I love this idea! But think it would be better if you could shorten the pitch to one paragraph. Do you need the mom? Is she an active character in the story? Since it takes place at school I wondered if she would be around. If you don't need her to move your story forward, I would suggest removing her. If you do keep her, would kids understand "no escaping your genes"? Would you need to simplify that to something like, "that's what makes you special" or "that's just the way you're made"? They may very well understand the genes reference...I was just wondering. Also, kids, as a group, really wouldn't be gazing at their belly buttons during gym class...maybe a random kid would...but not the whole group. Since it is gym class could you maybe have them doing curl-ups or something exercise related? Or maybe Herman has to restrain himself from slinking head-over-heals when exciting the bleachers or running bases in kickball??? Or it would be easy for Herman to un-slink and dunk the basketball or catch the high-fly ball, so he has to concentrate on staying coiled or he will be found out. Anyway, I'm not wording these very well but I think you could have something funny that would be more likely to happen in gym class. Now that I've said all that, I was thinking that if your story is full of slinky silliness that the belly button thing may fit right in! Anyway, it has been fun imagining your super fun idea! I hope I've said something helpful. I'm on the fence about today's WYRI. I'm intrigued by the Slinky and sort of get that it has something to do with his belly button, but things are a bit too vague on what the Slinky has to do with saving the day. Perhaps with a bit of tightening, like a quick inference to his difference, then a brief mention of the trouble could give the pitch a little more focus on the "why" I should rally behind the Slinky kid. For now, I'd like to but not just there yet. Way to multitask like a champ, Susanna! :D And thanks for the chocolate soup....could be even better for you than chicken soup! As for the pitch, I would read it because it sounds like a funny premise. But the title sounds too much like the very popular Diary of a Wimpy Kid. Even if Julie's intent is to spoof on that, I think it's too soon to do so. Spoofing on older popular books is a safer bet. As well, genes is a rather abstract concept for ages 3-6...it could work for ages 5-8 though so she can raise the age target, maybe? It's also a touch wordy to me. IMO, that whole last sentence can go without ruining the general fun idea of the story and pitch. 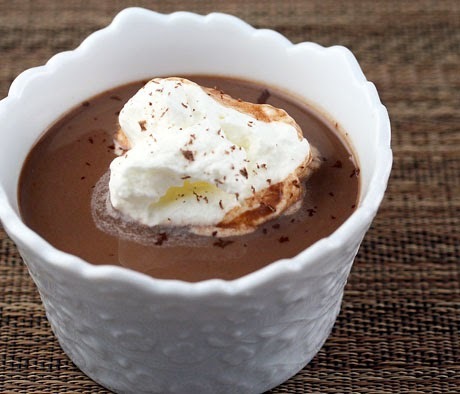 chocolate soup: m-m-good! (and so good for you) Congrats, Beth for your tomboy story... I can't wait to see what Erin has to say about it. And Julie - I love (!!) this story idea & would definitely read it. I don't care if a slinky is the traditional kind or something new... I am willing to read more to find out. Herman wishes he was just like everyone else. rescue mission, Herman reluctantly reveals his slinky status - (one or two things he does to save the day) - and ultimately realizes that being unique is cool. Congrats to Beth...there was fierce competition...all of the stories were great! Oh gosh, Cathy! I thought she meant an actual slinky - like the toy! I guess we'll have to ask her :) Thanks so much for sharing your impressions! Glad you're enjoying the soup, Sue :) And thanks so much for your thoughts for Julie - I'm sure she'll be thrilled! Thank you so much for acknowledging my multi-tasking awesomeness, Catherine! Now I feel like an Olympic multitasker :) And thanks for your thoughts for Julie! Pam, I will tell you my secret. I started by holding one thing. I practiced a lot until I was really comfortable with it. Then, when I felt ready, I moved up to two. It was a tough, but I had prepared will so I was able to handle it. I think you if you follow my training regimen you'll be able to do it too! :) Thanks so much for your thoughts for Julie. I just assumed she was referring to one of those slinky toys - you know, like a spring, it can down stairs and stuff - but I'm not sure! Chocolate soup, huh? We call that hot chocolate where I'm from! I would read it, but just looking at the pitch length I'd say it's too long. Here is a tightening suggestion. Herman comes from a long line of Slinky’s. He has the right number of fingers and toes, but hides his coil shaped middle section under his t shirt. When just another day at school calls for a daring rescue mission, Herman's flexibility might reveal an asset. You say potato, I say po-tah-to :) Thanks so much for your thought for Julie, Julie, and for your helpful rewording of the pitch! Congratulations to Beth. Erin's suggestions are so helpful. Interesting concept for a hero. It certainly will leave lots of room for an illustrator. I would probably read it. I just have trouble picturing the family tree. I agree with prior comments about tightening the pitch and getting Mom out of it. Good luck. Thank you so much Beth for chiming in with great feedback. The best way I can describe Herman is he looks like a normal kid, but instead of a torso that is straight up and down, his is shaped like a Slinky toy, making it easy for him to spring up into tall trees and perform daring rescue's, he just hasn't realised his real worth yet. So thanks again and I will do my best to get this across with a tightened pitch. Thank you to Susanna for hosting me today. Sorry I am a little late to the party, but it is still the wee small hours of the morning here... I can't wait to jump into your comments, so thanks to everyone for chiming in. Thanks Rosi, I hope the illustrator will be able to portray my Slinky family, he he, but I will keep tightening the pitch. Golden, thanks Julie, I will be copying and pasting that in, he he. Thanks for stopping by. LOL thanks Cathy, I have been toying with the idea of calling it Diary of a Linky Kid, as I have heard Slinky raises a few questions. No there are no smokey lounges etc, his middle section is shaped like a slinky, so he has no belly button at all... I also may have to change it as I have recently realised, that Slinky may be a patented word.... Thanks so much for joining us today. Thanks Wendy, yes I realise I have to remove the mum in the equation, as it takes the focus from main character. Thanks so much for joining us today. Thanks Catherine, I have the vacuum to the query as we speak, he he, thanks for joining us today. Thanks Donna, that is a great suggestions, I struggle with how to end things, he he. Thanks for joining us today. Thanks Angela, great feedback, I will get tightening. Glad you could join us. Hurrayy Penny, thanks so much for your think tank, awesome ideas. In the story, they start on the high ropes course in gym, so when you reach up your t shirt springs up and you can see your belly button, but not so for Herman, he is hiding his, as he has no belly button, but instead a torso shaped like a slinky.. he he. Thanks for your great ideas, and that is just what I want an illustrator to do, bring even zanier ideas than I can think of and illustrate them into the story, hurray. Thanks for stopping by. Thanks Cecilia, I am tightening it with everyone's feedback so this is really helpful to know. Great you could join us today. Thanks Iza, you are right, I have tried to allude too much. It is tough to know how much to reveal, but all this feedback has been so helpful. Hurrayyy, Tina, yes it is like a Slinky Toy and yes it could morph into a chapter book. I love the Flat Stanley reference, I had forgotten about him. Thanks so much for chiming in. Thanks Anne, great feedback, I will do my best to detail exactly how it is in my next pitch. Thanks for stopping by. Hurrayy Kim, thanks for your kind thoughts. I was hoping someone would say this could be high concept, hurrahhh. I know it is a stretch using the word genes, but I figure, I want to stretch kids to help them understand how he is that way, it is because of his parents etc, but that is still ok. Great feedback and thanks for stopping by. Thanks so much for stopping by and yes, I will clarify Slinky, as in the slinky toy, but I am leaning towards changing it to Linky, thanks so much for stopping by. What do you put between your toes? Hee, hee! Thanks so much for your perspective, Joy - I'm sure Julie will find it helpful! I would read it as well. Only concern I had - how did he keep the coils from showing through his clothes and bending too much. Such a fun idea tho. Yes, I would definitely read this. When I read "Herman comes from a long line of slinkies," I was hooked. An illustrator will have a field day with this one! I'm late as in Friday "technically" late. Congratulations Beth! I'm the queen of failed pitches, but wondering if it can be tightened up. I really like the "right number of fingers and toes" because it immediately gave me a "normal" image and then it's like whoa - he's a slinky? Also not certain about the mother's role throughout the story. She seems like a main character in the pitch. Is slinky a trademarked toy? I think either will of, Belinda - any form of chocolate and cream works for me :) Thanks so much for your thoughts for Julie! My sister and I used to make our own chocolate soup by stirring chocolate ice cream around in a bowl until it was soupy. Then we would pretend it was our medicine and administer it to each other by the (very large) spoonful :) Thanks for you thoughts for Ms. Grasso, Erik! Perfect Picture Book Friday - I Hatched!